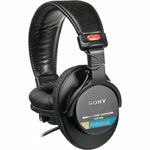 The Sony MDR-7506 is a large diaphragm foldable headphone designed for professional studio and live/broadcast applications. The MDR-7506's are professional, high quality, reference headphones engineered to be comfortable to wear for extended periods, making it ideal for usin in broadcast and studio environments. A 40mm PET diaphragm and neodymium magnet provide performance exceeding the requirements of digital audio sources.